A patent application made public on Thursday reveals Apple investigated the possibility of powering the new MacBook Pro's software configurable Touch Bar with electrophoretic ink, or e-ink, technology instead of an OLED multitouch unit. Dating back to 2013, Apple's patent application for an "Input/output device with a dynamically adjustable appearance and function" describes a keyboard, trackpad, mouse system capable of adjusting its appearance, and thereby input scheme, through built-in e-ink panels. 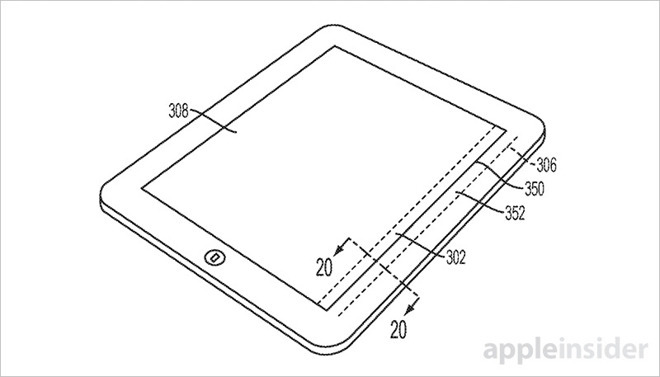 Alternatively, the same technology can be applied to sections of portable devices like the bezels of an iPad. For example, whereas traditional keyboards and mouse peripherals have a set number of input modes, respectively QWERTY keys and two or more buttons, a dynamically configurable version might feature many multiples of those same components. In particular, an e-ink capsule (enclosure, fluid and pigment) can be split or joined together to form different input areas, each labeled according to a host application. More specifically, and germane to the recent Touch Bar MacBook Pro, the invention details a keyboard with a configurable I/O strip that includes dynamically adjustable glyphs or symbols. Some embodiments hold that the e-ink strip might display a keyboard legend and include five keys in a first mode or two keys in a second mode. In this example, switching between first and second modes consolidates the five distinct interactive areas into two discrete sections, which subsequently provide extended software controls or system information. Swapping between the two modes can be triggered by a user action, like pressing the shift key, which offers a level of flexibility not available on traditional hardware. Beyond the usual I/O functions, Apple imagines the dynamic keyboard might act as a secondary monitor of sorts to visually communicate application or device specific graphical legends. For example, the strip can be configured to display GPS coordinates, Wi-Fi signal status or other relevant information. In another example, the legend might also refresh to display a native language, alphabet or symbols corresponding to nearby locations. Deeper in the patent filing Apple notes the size of each configurable button can be of dynamically adjusted depending on implementation and use. Music controls, for example, might be larger and include slider controls or a rocker switch to better facilitate audio playback functionality. Apple debuted a nearly identical consumer system when the Touch Bar landed on MacBook Pro in October. The multitouch OLED strip takes the place of an aging function key row to deliver dynamically adjustable assets, display app-specific controls, provide users with system status information and much more. While Touch Bar is already a marvel of engineering, today's patent goes on to describe more advanced and exotic features that didn't make it into the first version component. For example, the document describes a chameleon-like feature that allows the strip to match color and texture of the surrounding laptop chassis. Compared to OLED, achieving such designs is much easier with an e-ink strip, as the electrophoretic pigments can incorporate metallic particles that match desired characteristics. The filing goes on to describe in great detail the various methods and techniques of realizing a dynamically adjustable e-ink strip, from pigment variations to graphics transitions to ideal substrates and more. In addition, the application lays out sensing options —force sensors —and the possibility of maintaining onscreen content on low power or no power, a feature unique to e-ink displays. Finally, Apple notes e-ink Touch Bars or similar components can serve as useful secondary inputs for space-constrained portable devices like iPad. Whether Apple plans to integrate the e-ink technology described in today's application into a next-generation Touch Bar is unclear. Also unknown is whether the company intends to bring dynamically adjustable I/O components to other peripherals like a track pad or mouse. Reports earlier this month suggest Apple will bake Touch Bar and Touch ID support into its standalone Magic Keyboard line, but only if the technology proves successful on MacBook Pro. 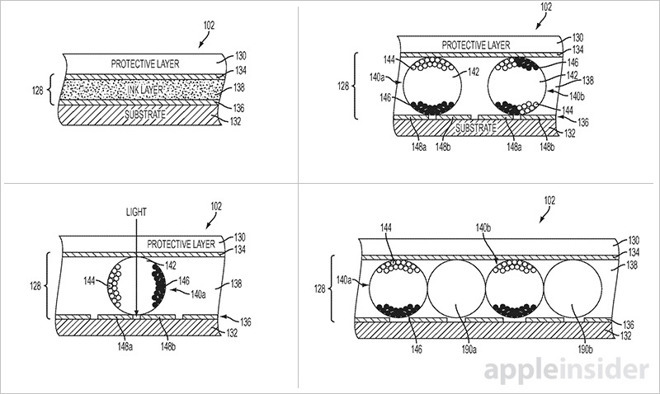 As published today, Apple's e-ink Touch Bar patent application was first filed for in September 2016 and credits Chris Ligtenberg, Euan S. Abraham, Jun Qi, Paul S. Drzaic, Po-Wen Chiu, Ron Hopkinson, Michelle Goldberg, Victor H. Yin, Bartley K. Andre, Mikael Silvanto and Erin Turullols as its inventors.